“Optical Measurement of Tissue Blood Flow, Hemodynamics and Oxygenation,” Yodh, A.G., Greenberg, J.G., Yu, G., Detre, J.A., Durduran, T., Burnett, M.G., Mohler, III, E.R., Hahn, S., and Quon, H., US Patent 8,082,015, Issued 12/20/2011. “Process for producing nanoporous carbide derived carbon with large specific surface area,” Therien, M., US Patent 7,842,758, Issued 11/30/2010. “Conjugated materials featuring proquinoidal units,” Therien, M.J. and Susumu, K., US Patent 7,842,758, Issued 11/30/2010. “Processes for the synthesis of dendritic macromolecules from conventional monomers,” Percec, V., US Patent 7,776,971 B2, Issued 8/17/ 2010. 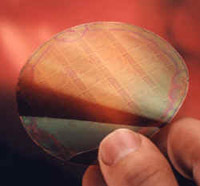 "Ferroelectric thin films,” Rappe, A.M., Sai, N. and Kolpak, A.M., US Patent US 7,768,050 B2, Issued 8/3/2010. “Dispersion method,” Winey, K.I., Du, F. and Haggenmueller, R., US Patent 7,759,413, Issued 7/20/2010. “Ceramic anodes and methods of producing the same,” Gorte, R. and Vohs, J., US Patent 7,740,772, Issued 6/22/2010. “Polymersomes incorporating highly emissive probes,” Hammer, D., Therien, M. and Ghoroghchian, P.P., US Patent 7,682,603, Issued 3/23/2010. “Amphiphilic dendritic dipeptides and their self-assembly into helical pores,” Percec, V., US Patent 7,671,033, Issued 3/2/2010. “Non-volatile resistance-switching oxide thin film devices,” Chen, I.-W., Wang, Y. and Kim, S.G., US Patent 7,666,526 B2, Issued 2/23/2010. “Polymer-based surgically implantable haloperidol delivery systems and methods for their production and use,” Siegel, S.J., Winey, K.I., Gur, R.E. and Lenox, R.H., US Patent 7,666,445 B2, Issued 2/23/2010. “Methods, systems, and computer program products for computational analysis and design of amphiphilic polymers,” Doerksen, R., Chen, B., DeGrado, W.F. and Klein, M.L. US Patent 7,590,517, Issued 9/15/2009. “Living radical polymerization of acrylic monomers and the formation of block copolymers therefrom,” Percec, V., US Patent 7,470,762, Issued 12/30/2008. “Reversibly adaptive rough micro- and nano-structures,” Yang, S., US Patent 7,459,197, Issued 12/2/2008. “Synthesis, spectroscopy, photophysics of multichromophoric Zn(II)/group 8 metal complexes,” Therien, M., US#7,445,845, Issued 11/4/2008. “Living radical polymerization of halogen-containing acrylic monomers and the formation of block copolymers therefrom,” Percec, V.; US Patent 7,345,127, Issued 3/18/2008. “Polymer-nanotube composites, fibers, and processes,” Winey, K., US Patent 7,285,591, Issued 10/23/2007. “Flame retardant composite,” Winey, K., US Patent 7,265,175, Issued 9/4/2007. “Solid-state electrochemical NO.sub.x sensors,” Gorte, R. and Vohs, J., US Patent 7,220,343, Issued 5/22/2007. “Polymersomes and related sncapsulating membranes,” Discher, B., Discher, D. and Hammer, D. US Patent 7,217,427, Issued 5/15/2007. “Magnetically and electrically-induced variable resistance materials and method for preparing same” Chen, I.-W. and Mamchik, A. US Patent 7,211,199, Issued 5/1/12007. “Nanometer-sized carrier medium,” Chen, I-Wei, US Patent 7,189,417, Issued 4/13/2007. “Facially amphiphilic polymers as anti-infective agents,” DeGrado, W.F., Klein, M.L. and Tew, G., US Patent 7,173,102, Issued 2/6/ 2007. “Interfacial polymer incorporation of nanotubes,” Winey, K.I., Haggenmueller, R. and Du, F., US Patent 7,148,269, Issued 12/12/2006. “Nanotubes and nanofilaments dispersion in thermoplastics and thermosets by In-Situ polymerization methods ” Winey, K., US Patent 7,148,269, Issued 12/12/2006. “Scanning probe microscopy apparatus and techniques,” Bonnell, D., US Patent 7,093,509, Issued 8/22/2006. “Spatially resolved electromagnetic property measurement,” Bonnell, D.A., Kalinin, S.V. and Alvarez, R.A, US Patent 6,873,153, Issued 3/29/2005 and US Patent 7,078,896 Issued 7/18/2006. “Aqueous room temperature living radical polymerization of vinyl halides,” Percec, V. and Popov, A.V. US Patents 6,911,515 Issued 6/28/2005 and 7,026,420, Issued 4/11/2006. “Method for solid oxide fuel cell anode preparation,” Gorte, R. and Vohs, J., US Patent 7,014,942, Issued 3/21/2006. “Directed assembly of nanometer-scale molecular devices,” Bonnell, D., US Patent 6,982,174, Issued 1/3/2006. “Porous electrode, solid oxide fuel cell, and method of producing the same,” Gorte, R. and Vohs, J., US Patent 6,958,196, Issued 10/25/2005. “Process for the living radical polymerization of chlorine containing monomers”, Percec, V. and Asandei, A. US Patent 6,838,535, Issued 1/4/2005. “Polymersome related encapsulating membranes,” Discher, D.E., Discher, B.M., Lee, Y.J.C.-M., Bates, F.S. and Hammer, D.A., US Patent 6,835,394, Issued 12/28/2004. “Design, preparation, and properties of antibacterial b-peptides,” DeGrado, W.F., Hamuro, Y. and Liu, D.-M., US Patent 6,677,431 B2, Issued 1/13/2004. "Method for making boron carbide containing ceramics." L. G. Sneddon and Mark J. Pender, US Patent 6,478,994, Filed 3/30/2000, Issued 11/12/2002. “Encapsulation of biomaterials in porous glass-like matrices prepared via an aqueous colloidal sol-gel process,” Liu, D.-M. and Chen, I.-W., US Patent 6,303,290 Issued 10/16/2001. "A new class of Siloxane polymers for silicon dioxide deposition," Arkles, B., Berry, D. H. and Figge, L. K., US Patent No. 5,853,808, issued December 29, 1998. "High molecular weight polyanilines and synthetic methods therefor," MacDiarmid, A., et al., US Patent No: 5,276,112, issued 1/4/1994. "Processable, high molecular weight polyaniline and fibers made therefrom," MacDiarmid A, et al., US Patent No: 5,312,686, issued 5/17/1994. "Substituted porphyrins, porphyrin-containing polymers, and synthetic methods therefor," Therien M, et al., US Patent No: 5,371,199, issued 12/6/1994. "Processable, high molecular weight polyaniline and fibers made therefrom," MacDiarmid A, et al., US Patent No: 5,177,187, issued 1/5/1993. "Poly(b-alkenyl-borazine) ceramic precursors," Sneddon L, et al., US Patent No: 5,202,399, issued 4/13/1993. "Organometallic precursors in conjunction with rapid thermal annealing for synthesis of thin film ceramics," Berry D, et al., U.S. Patent No: 5,217,754, issued 6/8/1993. "Borazine derivatized polycarbosilane polymers and the ceramics derived therefrom,"
Sneddon L, et al., US Patent No: 5,256,753, issued 10/26/1993. "Processable, high molecular weight polyaniline and fibers made therefrom," MacDiarmid A, et al., US Patent No: 5,258,472, issued 11/2/1993. "Preparation of group IIIA-VA compounds such as boron nitride, and of boron nitride films and coatings," Sneddon L, et al., US Patent No: 5,126,168, issued 6/30/1992. "High capacity polyaniline electrodes," MacDiarmid A, et al., US Patent No: 4,940,640, issued 7/10/1990. "Poly(alkenylpentaborane) ceramic precursors," Sneddon L, et al., US Patent No: 4,946,713, issued 8/7/1990. "Methods for preparing conductive polyanilines," MacDiarmid A, et al. US Patent No: 5,403,913, issued 4/4/1995. "Preparation of base-type conducting polymers," MacDiarmid A, et al. US Patent No: 4,806,271, issued 2/21/1989.